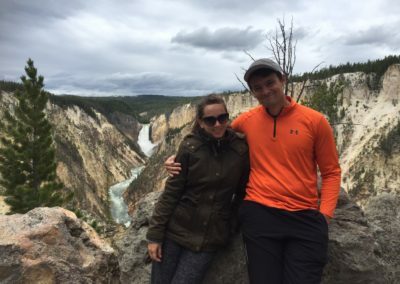 Growing up on the East Coast, my parents never deigned to drive the 30+ hours to Yellowstone—especially with three young kids. Once I moved within road-tripping distance, I planned a trip as soon as I could (for June 2017). I’ve compiled my favorite things to do in and around Yellowstone. Enjoy this guide and to plan your own wild and wonderful adventure! Tourist attractions are popular for a reason—they’re cool! While traipsing through New York City’s Times Square is hell on earth, exploring nature’s equivalent is much more enjoyable. If only these turquois geysers weren’t near boiling and sulfuric; they all looked so amazing I wish I could have taken a dip! This was the first stop we made in from the western Yellowstone entrance and it didn’t disappoint. It was a little scary at first roaming the boardwalks—realizing I was walking on top of the fiery super volcano. However, as long as you stay on the path you should be safe! Just selfie responsibly, so you don’t wind up like a boiled lobster. 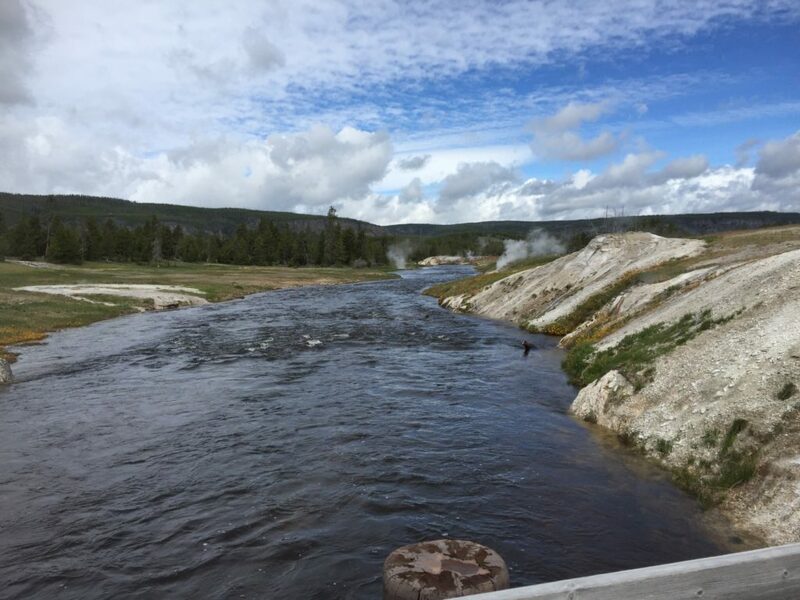 Oh, and get used to smelling the not-so-savory egg aroma that every geyser spews into the air. 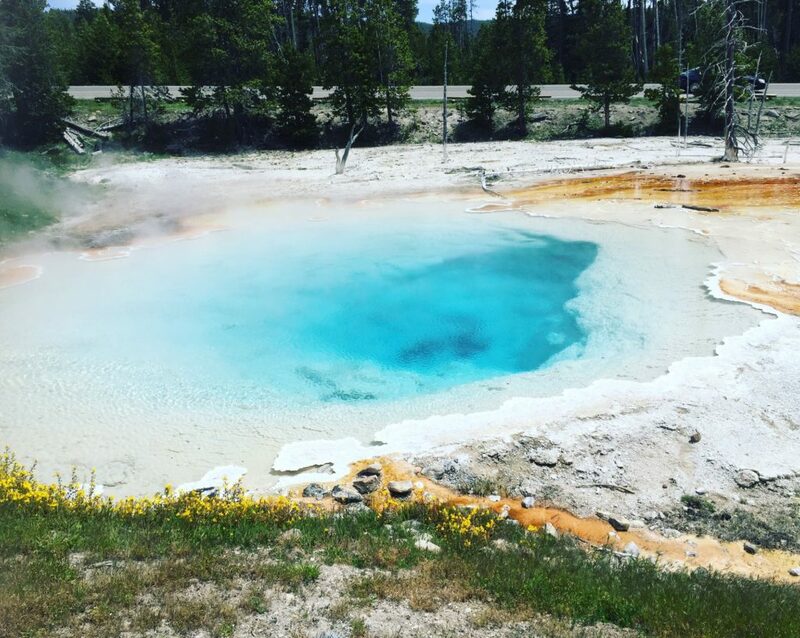 Yellowstone’s hundreds of geysers and hot springs are an incredible sight to see. Out of them all, Grand Prismatic is one of the most stunning. I was too busy gawking to learn about the geological history, but I did take time to marvel at the rainbow of colors surrounding this other-worldly water feature. It seriously looks like it belongs on Mars. Get ready for crowds on this one; it’s something everyone wants to see with their own eyes. But if the upper hike to the Grand Prismatic Spring overlook is open, you have an opportunity to avoid a lot of the tourists. Unfortunately, it wasn’t open while I was there, but if you’re visiting in mid summer you can definitely take this route! You’ll have to hoof it a couple miles, but it’ll be worth it to arrive above Prismatic so you can get that amazing view. Old Faithful has become less so as the years have passed—erupting erratically every 60–90 minutes. The telltale sign it’s about to blow? The crowd of people surrounding its base. It’s definitely worth the wait to see this geyser spout boiling water and steam 50+ feet into the air. Out of all the geysers I saw in Yellowstone, this was the most impressive. 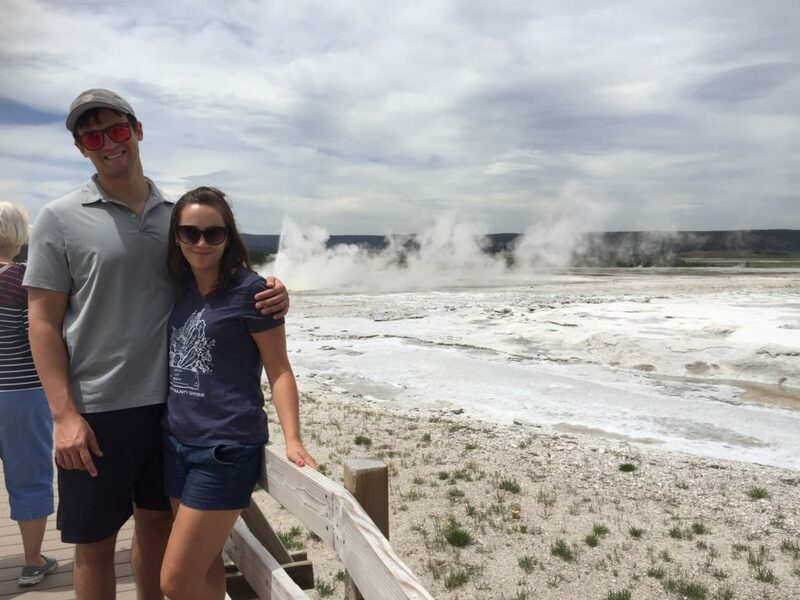 Before arriving in Yellowstone, I thought Old Faithful was a standalone geyser; what I didn’t realize is that that area has a lot more to offer. 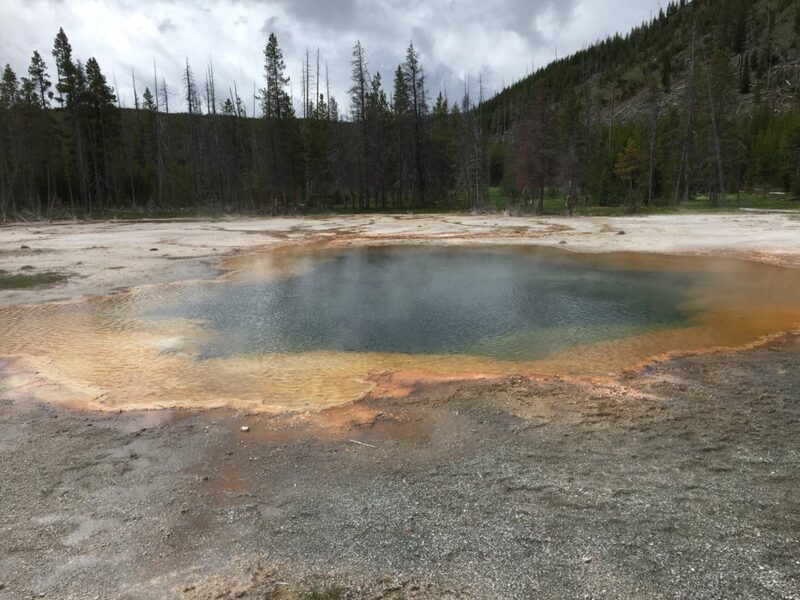 The whole property has miles of boardwalk where you can observe dozens of other geysers. Walk the whole path to see one-of-a-kind geological features and most likely a marmot or two. I was lucky enough to spot a few deer, chipmunks, and a bear too! If you’ve been to Lake Tahoe you’ll see a lot of similarities between its turquoise waters and those of Yellowstone Lake. This lake is humongous! You can either pack a picnic and enjoy sitting on the shore or take the road to loop around it and take in the vistas on-the-go. The water is frigid, so you probably won’t want to swim. I did see a couple boats out there, so you might be able to look into a water tour. It’s easy to get jaded by waterfalls. This one broke me out of my “been-there-done-that” state of mind. I have never seen so much water gushing over an edge at once. I took the lower falls trail to the top of the second waterfall and got a bit of vertigo because of the height and the rushing water. It’s seriously so cool. Plus, across the way you’ll be able to glimpse the upper falls and the treacherous Uncle Tom’s Trail stairs (which I get into below). Definitely make this stop if you want to see a waterfall unlike any other. No matter where you’re staying in Yellowstone, book a year in advance! I’m not kidding when I say these things book up that far out. If you want the best campsite or lodging, heed these words. Unless you want to camp and deal with Yellowstone’s many bears, moose, and drastic temperature swings, you should try out the cabins at Old Faithful. Each is essentially a tiny home, but perfect for up to three people. The best part? They’re only about $300 per night. Wake up to Old Faithful going off mere yards outside your front door—and without critters in your tent. Plus, beer, wine, and hot breakfast are only a short jaunt away in the nostalgic Yellowstone Lodge and neighboring buildings. I’m not gonna lie, the food in Yellowstone leaves much to be desired. But that’s not what you’re there for, is it? 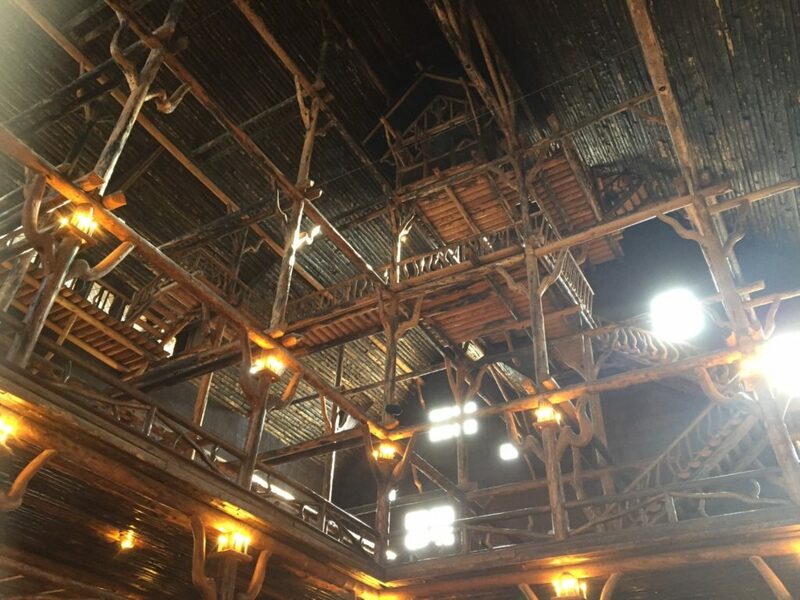 Out of all the dining (including the “fancy” dining room at Yellowstone Lodge), here’s what I liked most. If you’re by the fishing bridge for the annual trout spawn (where you can see grizzly bears catching their lunch), stop inside the general store to sit at a retro-like counter on barstools and order a delicious grilled cheese or burger. You can’t go wrong with either. And don’t forget to treat yourself to a scoop or two of the local ice cream on your way out! A lot of the food sold in Yellowstone is sustainably raised nearby, so you can feel good about what you eat. Unless you get a permit and ride on a helicopter, you can’t explore much of Yellowstone’s backcountry—and there’s a lot of it. The roads, campgrounds, and buildings only cover two percent of the park! It’s safer to stay in more populated areas anyways unless you always carry bear spray and your wits. Here are my favorite two trails of the trip that didn’t make me feel like I might become a grizzly’s next meal or collapse from exhaustion. Don’t like heights? Then Uncle Tom’s Trail isn’t for you. This insane staircase climbs down the side of Lower Yellowstone Falls, but offers a gorgeous view and experience you won’t ever forget. The trail runs a couple miles along the canyon rim, so every step is exciting and breathtaking. Make sure to wear shoes with good footing and bring layers since it gets much cooler by the falls. If you’re not from higher elevation, you’ll love Observation Point Trail. This trail is less than a mile and starts on the grounds of Old Faithful Lodge. In short, it’s short and not too strenuous. This trail winds through the trees to an elevated lookout of the famous geyser. For the best views, plan to start your hike 30 minutes before Old Faithful is supposed to erupt. Nature does everything on its own schedule, but getting there early will ensure you get a whole new perspective of this epic anomaly. If you’re road-tripping to Yellowstone, don’t miss these vistas and routes. I drove in through Idaho to the west entrance and then took the extra hour and a half detour to explore Wyoming. I’m so glad I did! 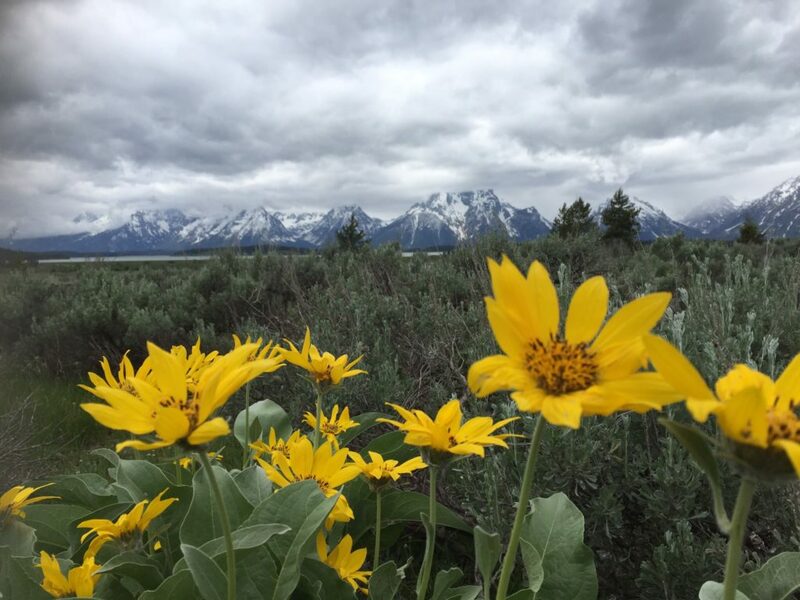 Depending on where you’re coming from, you’ll most likely be able to enjoy some of Grand Teton National Park on your way in or out. Even if it’s out of your way, make this part of your Yellowstone road trip! The Grand Tetons are stunning with white snowy peaks often higher than the clouds. We stopped off at a bunch of points, but much of it was closed because of bear cub season. In fact, we missed a mama bear and her cubs cross the road by just a couple of minutes! One cool stop-off is the well marked historic Cunningham cabin. This cabin is from pioneer days (the 1880s) and provides a cool glimpse of history. 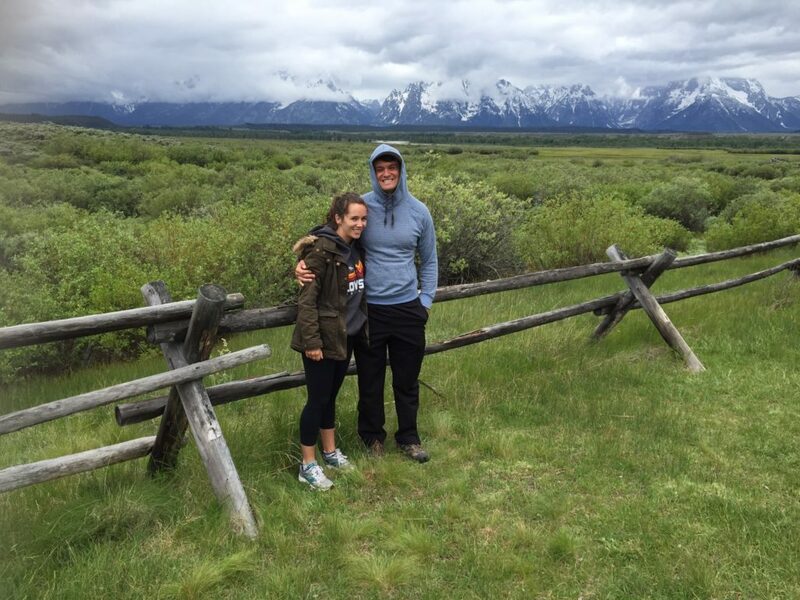 It’s also an awesome photo op since you’re surrounded by greenery, flowers, and the jagged Teton mountain range. Just remember to buy the joint Yellowstone and Grand Teton pass to save about $10 on park fees. Or, buy the season pass for all of America’s National Parks to save even more and see incredible things all year. Your Yellowstone trip most likely won’t coincide with ski season, but there’s still plenty to enjoy in and around Jackson Hole, Wyoming. Pop into the many quaint shops, get a bite to eat, or enjoy an alcoholic slushies at one of the gas stations! Coming from Utah, this was a serious perk of the trip. You could spend every weekend for the next decade in Yellowstone and still not see it all. Every time you go, you’ll discover new creatures, experiences, and favorite activities. A word to the wise: pack lots of layers! When I originally showed up it was a warm 80 degrees, but over the course of the weekend it dropped into the 40s. I was definitely unprepared and would have been much better off with a winter coat. 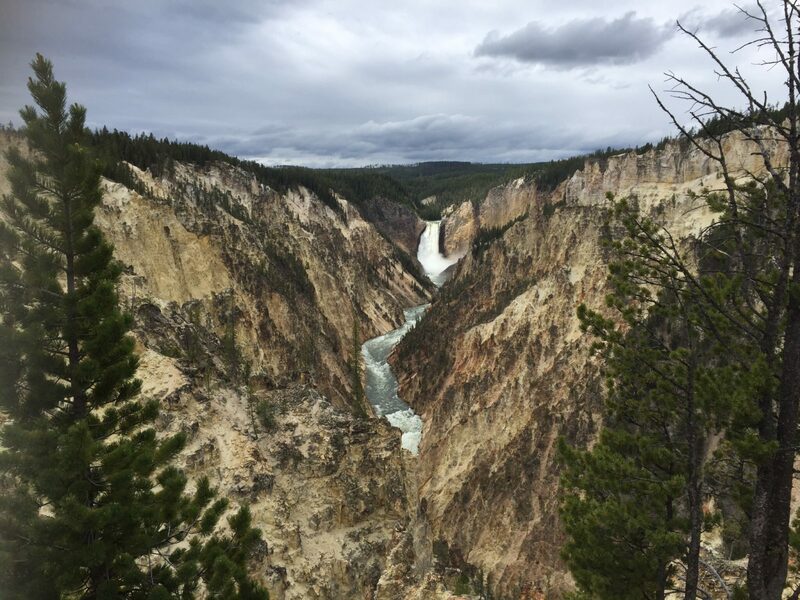 Prepare yourself for weather by reading our our guide on the best times to visit Yellowstone. As long as you remember you’re traveling to a very wild place with volatile temperature and weather shifts, you’ll be good to go! Have an incredible adventure. 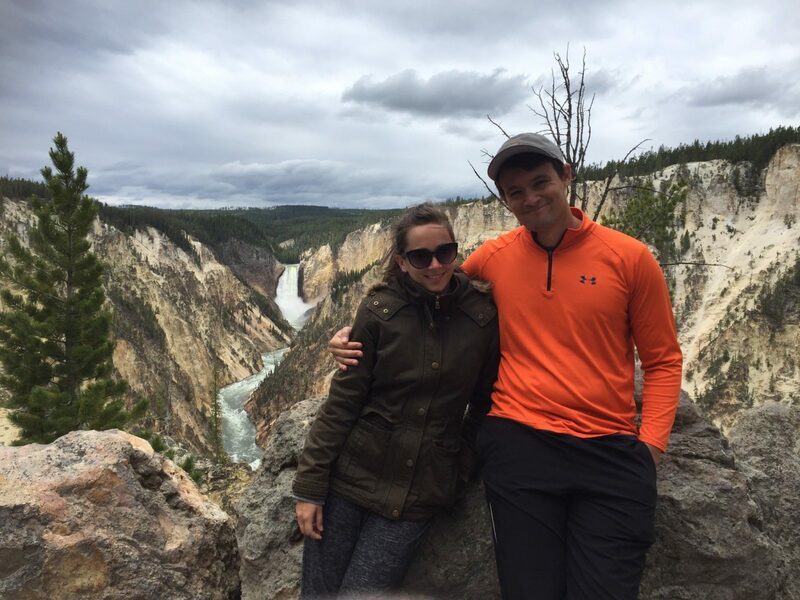 I hope you get to experience some of my favorite Yellowstone activities and discover plenty of your own.